This Countertop Display Case Locks to Prevent Jewelry Theft! This Store Fixture Is a Trophy Showcase Made of Acrylic for an Economic Option! 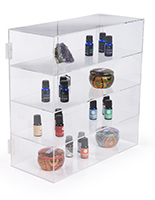 Buy This Countertop Display Case Today! Octagon design provides a modern appearance. Acrylic construction has lower price points than glass. Hinged door will open quickly. (2) Keys included for locking and unlocking the cam lock. 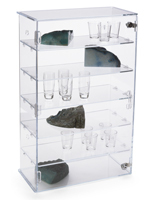 This countertop display case, also known as a jewelry showcase, includes the (2) shelves to best present the desired merchandise. The counter retail store fixture allows users to show their items on three different levels (the shelves are not removable). This countertop display case includes rubber pads on the bottom to prevent scratching or scuffing on the table. 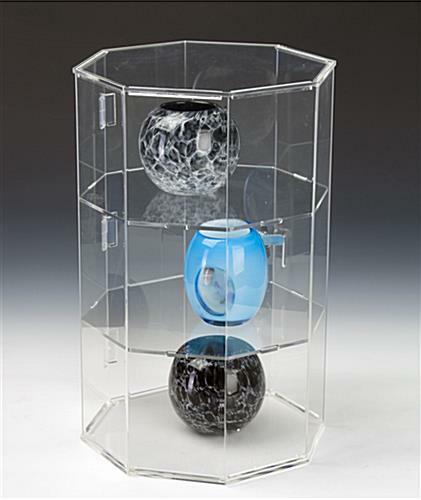 The jewelry showcase has the 9-1/4" wide hinged door opens quickly for fast content changes. 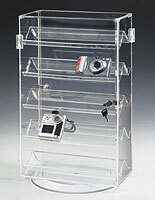 This hinged countertop display case can be set-up to face the customer or employee side of the counter. There is a cam lock on each door that will prevent unauthorized personnel from opening the units (set of two keys provided). 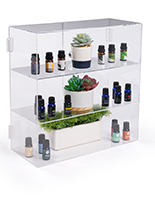 This octagonal countertop display case is an extremely cost effective means of presenting the latest in store merchandise. The jewelry showcase helps sell high end electronics, figurines, dolls, autographed sports memorabilia, models and many other goods. 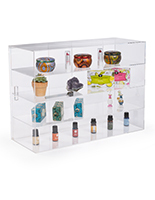 This acrylic countertop display case is far less expensive than similar glass models. The jewelry showcase features the octagon shape for an eye-catching design. 13.8" x 20.5" x 13.8"